Blue Line have been established for over 35 years, supplying a quality, professional and prompt service to our customers within Herefordshire, all over the UK and many overseas visitors. Blue Line offer a complete portfolio of services, ranging from Taxis, MPV’s, Minibuses, Executive Travel, Coaches and Courier Service to Wheelchair Accessible Vehicles. We pride ourselves on being a very professional, efficient, reliable and customer friendly company specialising in extensive services that include: all local trips, airport trips, distance travel, weddings, business meetings, conferences, events, contract work, station and hospital collections and much more. 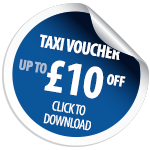 Our fleet of over 80 licensed vehicles enables us to be the largest Taxi company in Herefordshire to supply our customers the highest possible ground transportation service, 24 hours a day, 365 days of the year. Having procured an innovative and computerised booking and dispatch system, we can guarantee that our service is the most efficient you will find in Herefordshire and beyond. Thank you for a very satisfactory and friendly service, I could not fault it in any way. Richard arrived at the stated time, and was very pleasant, polite and helpful. We will certainly use you again and recommend you to others. Many thanks.